All plants have demanding regulations and detailed tracking requirements. Unfortunately for the folks trying to meet those strict regulatory requirements, power plant technology, regulatory and financial requirements vary so much between facilities that no single software solution exists that encompasses them all. This makes it hard for power generators to simplify their log keeping, which leaves a whole lot of you either staring down that green ledger, or cobbling together some combination of spreadsheets, documents, and possibly a la carte software to make sense of daily log keeping. At eLogger, we know that regulators demand compliance, and we know the rules are always subject to change. We know you have a large amount of data to track, much equipment to monitor, multiple locations, and a number of users, each requiring varying degrees of access. We know because we work for hundreds of power industry facilities. And although every single one is different, they need similar things from their logbooks: transparency, efficiency, better communications, and accountability. eLogger is built around these four goals. Power clients’ success often hinges on the talent and success of their operators. eLogger is designed by operators, for operators. 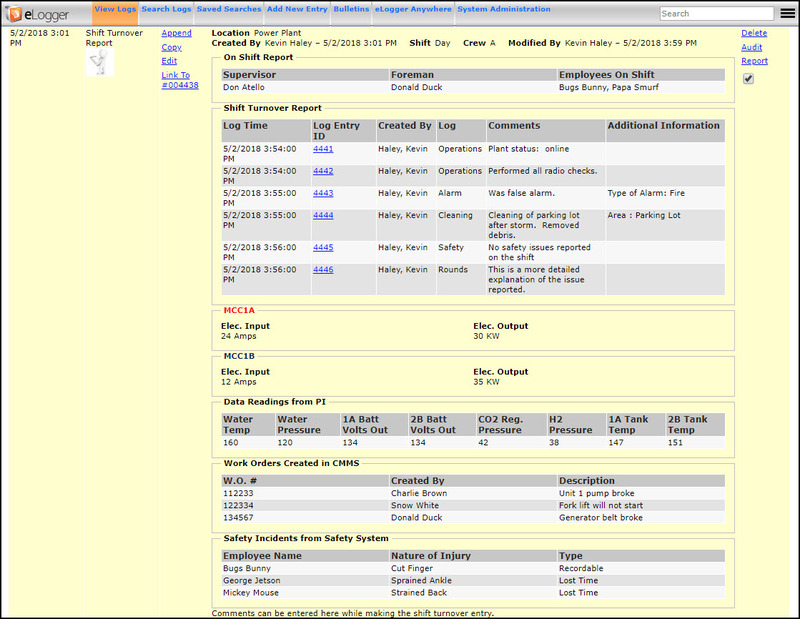 The software is configured to be as minimal a distraction from the work your team is doing as possible. Your software shouldn’t dictate your workflow- your workflow should determine the way your software works. 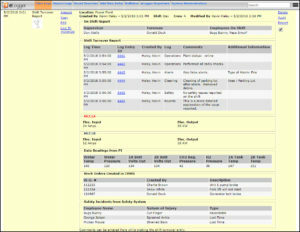 The organization of information in eLogger makes your logbooks clear, insightful, and most of all, common-sense. It’s easy to find your information in eLogger because it will be where you’d think it would be. Most plants must perform inspections to comply with OSHA regulations, documenting fire system weekly tests, fire extinguisher inspections, eye wash station inspections and other safety related items. Using eLogger for these inspections improves compliance and thereby accountability, and transparency where it’s most critical. All plants have some environmental requirements, necessitating weekly, monthly, and annual documented inspections. Using eLogger to marshal and organize environmental compliance improves transparency, which makes accountability a much more pleasant process. Moreover, ready access to up-to-the-minute inspection information aids communication and improves efficiency. Satisfying regulatory reporting requirements can be cumbersome and time consuming. 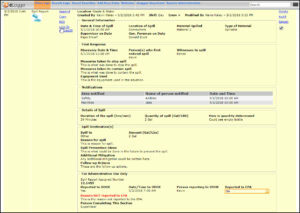 eLogger can preformat data for automatic upload, reporting, and ready communication. 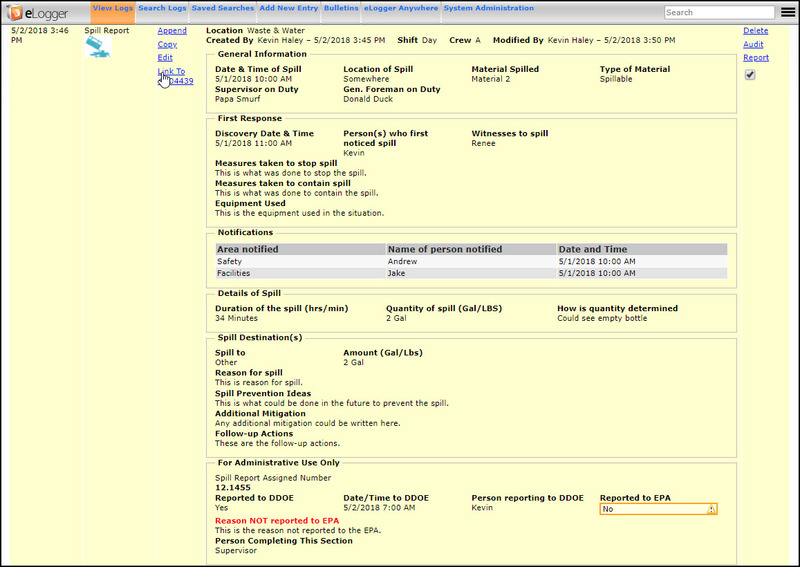 You can click a button to generate and email your report, upload it, whatever. It’s a communications tool, and will help you be accountable when you need to be. 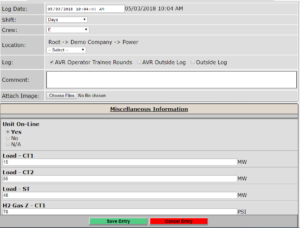 eLogger Anywhere allows operators to continue making log entries, regardless of internet connectivity/network availability. The ability to enter, review, and quickly see snapshots of data while making rounds simplifies and expedites the rounds process, making it more efficient, more transparent, and improving communications. Communicating between operations, management and maintenance can be a difficult, especially in the thick of a busy shift. With eLogger, streamlining the flow of information from operations to management and maintenance is built into the software itself. Aggregating shift information, culling important data from other systems and incorporating them seamlessly into reports that can be automatically sent to anyone you choose provides enormous value for overall plant communications. Equipment issues, safety information – anything you wish to capture- can be readily shared with whomever needs to know, immediately. This improves communications across all plant specialties, giving everyone better information, faster.